Here's how to make your own natural homemade peanut butter from fresh or roasted peanuts. There are many reasons to do so: taste, nutrition and safety. Almost all of the commercial peanut butters contain added sugar, salt, oils, and often preservatives. Home-made peanut butter is not only healthier, is also tastes much better! You can make it smooth, chunky or in between! You can use peanuts, cashews, pecans, hazelnuts, almonds, pistachios, or other nuts, including a mixture. 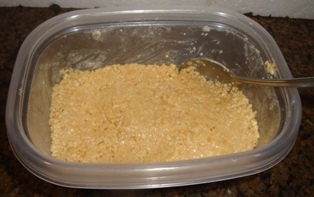 January 2009 outbreak of illnesses caused by Salmonella Typhimurium from peanut butter and peanut paste produced by the Peanut Corporation of America (PCA) at its Blakely, Georgia processing plant. So let's see how easy it is to make your own peanut butter! Here's how to do it, complete instructions in easy steps and completely illustrated. Prepared this way, the jars have a refrigerator shelf life of 3 or 4 months and indefinitely in the freezer. Unfortunately, it is not considered to be safe to "can" peanut and other nut butters at home. Vegetable oil (just a small amount, 1 or 2 tablespoons). I prefer peanut oil, but corn, sunflower, safflower, etc,. all work. I would not use olive oil because it would adversely affect the taste. Unless you bought shelled peanuts, you will obviously need to shell them and discard the shells (they make great mulch in the garden or add to your compost) . I just quickly shell them by hand, and don't bother much with the thin read skins. 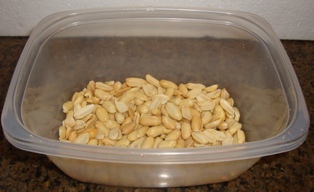 When I have the peanuts shelled, I take them outside and just blow into the bowl while stirring it. The skins float away! Set up your blender or food processor with the metal food processor blade attached, and add 2 cups of raw or roasted shelled peanuts into it. 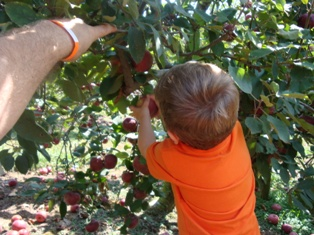 Step 3 - Get chopping! 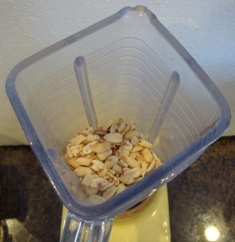 Cover the bowl with the blender's lid and chop up the peanuts continuously for 2 to 3 minutes or until the mixture starts to clump up and is finely chopped. 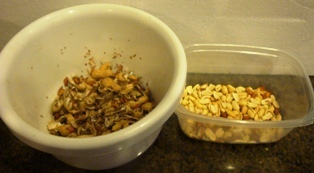 Scrape down the food processor bowl to mix back the peanuts that are pushed to the outside where they won't get chopped. Process until you get the consistency you like (chunky or smooth). 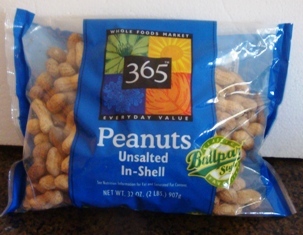 Most peanuts don't contain enough oil naturally to make a smooth butter. You only need to add about 1 and 1/2 teaspoons of vegetable oil (peanut oil is best, obviously, but any neutral flavored oil, like sunflower or canola oil works). Just mix it in with a fork. 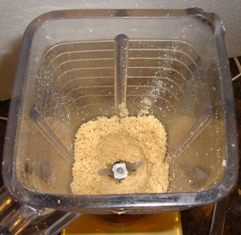 Your blender may not be powerful enough to do this without sticking, so you may want to mix the oil in, in a separate bowl. 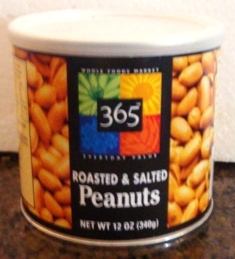 Taste the peanut but ter and add a touch of salt, if you like! For those that prefer a sweet peanut butter, you can add 1 tablespoon of honey, brown sugar or, if you are diabetic, Stevia (in a prepared form like Truvia, it measures same as sugar; if you use another form, you'll need do your own conversion) - or Splenda, if you prefer, or other artificial sweetener. Just spoon peanut butter into a jar and seal. Store it in the refrigerator until you use it. It should keep for a month or two. You can also freeze it. It will keep indefinitely in the freezer. In both cases, you may need to stir the peanut butter to mix the oils back in (the oil tends to separate over time). And no, you cannot "can" the peanut butter - it is too low acid to safely can with home equipment.